Hi guys! I've got something a bit more toned down for you this week. I've done so much nail art lately that I needed a nice and simple palette cleanser. Coincidently I visited the new Kiko store near me this week! I no longer have to go to Germany to get my Kiko fix! Now I can just go one town over to check out all the pretties! So this week I've got some swatch pictures for you of the new polishes I picked up! I was very proud of myself after shopping, since I only bought 2 polishes on my Kiko trip! I just picked the 2 I liked best (and didn't already have hah!). And it was only when I got home I noticed that they go together perfectly. So I decided to to do a simple accent nail manicure with them. And it was only after I had done that that I noticed that these 2 colors match my crochet blanket colors again...no wonder I thought they look great together, I've done this combination before! And they are great polishes as well. 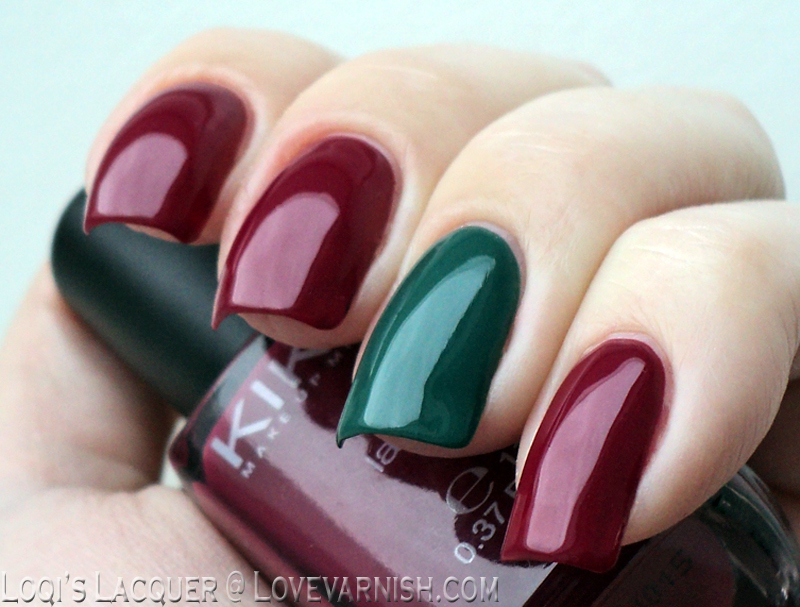 They are 287 Purple red, a lovely burgundy crème and 50 Ivy green, a beautiful jade crème. Both applied lovely, smooth and opaque in 2 coats! I can't stop saying how impressed I am with Kiko polishes, I am so glad they have a store near me now!